Rajasthan, including Jaisalmer. Jaipur is painted pink, Jodhpur is famous for its blue and Jaisalmer has a desert yellow hue, which beautifully blends with its rustic surroundings. 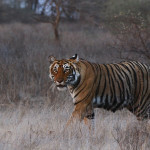 All set to get enchanted by the beauty of Jaisalmer attractions, I began my journey in the morning. 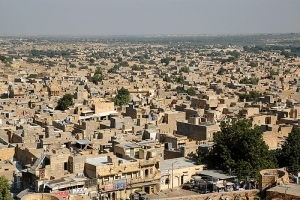 My first halt was the Jaisalmer Fort, which is visible from almost every corner of the town. 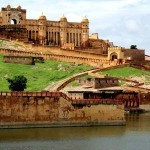 It’s a huge fort, which is one of the largest forts of the world. It stands majestically in the middle of the unfathomable Thar Desert on Trikuta Hill. It has three layers of walls. It looks like a part of the desert itself because of its golden yellow colour. A few steps ahead of the entrance gate locals sell handicrafts like music instruments and anklets. One woman literally got after my life to buy the anklet article. I ignored her and moved quickly from there. While exploring the fort I dined at one of the roof top restaurants in the fort. The restaurant offered wonderful views of the town. The next attraction I visited in the fort was Laxminath temple. It has exquisitely carved stone pillars and an open courtyard. The inside walls of the temple are adorned with paintings of Lord Krishna. I also saw the Royal Palace. 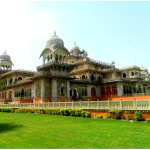 Located outside the fort is the mesmerizing Patwon Ki Haveli , which is intricately carved. Built in yellow sandstone, the haveli boasts of around 60 balconies and flawlessly carved lattice work. In the evening I went to scan the bustling bazaars of Jaisalmer to buy colourful and beautiful handicrafts. «Next Post Deshnok Temple – The Kingdom Of Rodents!